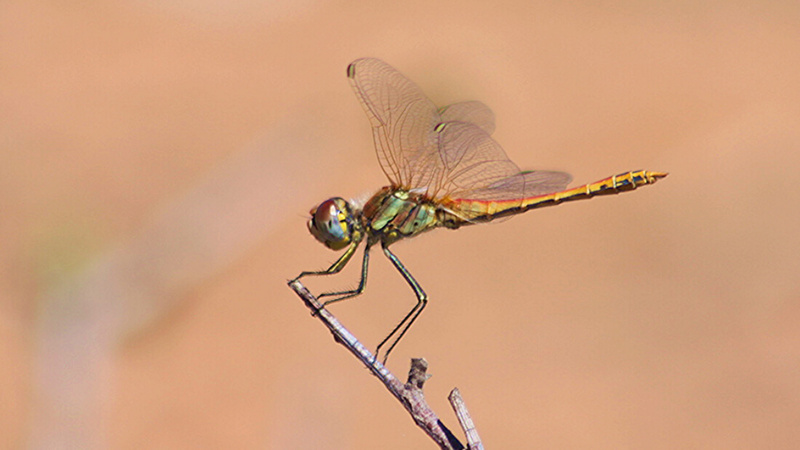 With a recorded 91 species of dragonfly in the Waterberg, these little hunters are found around water throughout the region. Their compound eyes give them excellent vision, and they can move their body and head completely independently, giving them the ability to pre-empt the position of their prey with great accuracy. They have a hit rate of up to 95%, making them one of the most successful hunters in the world! To put this into perspective; dragonflies are about four times more effective than lion in catching their chosen prey. Being highly territorial, aerial dog fights are common, males ripping into competitors’ wings with no hold barred. Victorious males get the pick of the available females, and the best hunting grounds. With Kaingo’s long river frontage, it is worth looking for these creatures. Maybe you get the chance to witness a kill!